Altınbaş Kıymetli Madenler Borsası A.Ş. Increasing its influence in the finance market thanks to its innovative solutions introduced, Creditwest Bank was founded in Cyprus under the title of Altınbaş Bank in 1993. 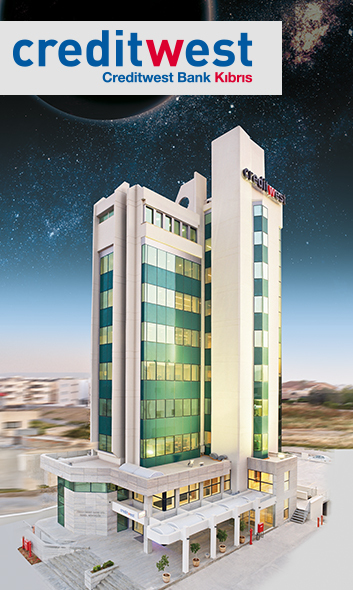 Opening its first branch in Sarayönü, Cyprus in 1994, the bank increased the population of its branch office to 8 with Nicosia, Famagusta, Kyrenia and Güzelyurt offices and began providing service throughout the island in 2000. Providing excellent service quality and customer satisfaction, the bank enlarged its customer base in addition to proliferation of its product range. Putting its signature under another successes one more important than another, Altınbaş Bank founded Starcard LTD in cooperation with 5 different local banks in Northern Cyprus, operating highest number of ATM, POS and credit card network for the time being in 2005. Thanks to the act of Altınbaş Group’s vision to establish international finance network in 2006, the decision was adopted to bring all financial corporations under the brand name of “Creditwest”, to that end, Altınbaş Bank, the oldest financial corporation of the Group organized under Creditwest Bank of Cyprus and concentrated on the investments for the infrastructure in 2006. Combined with introduction of professionalism and establishment of a robust corporate structure, personal commercial portfolio increased rapidly. Investing on its own employees for their expertise in the course of time, the bank adopted the customer representative system in 2010. Thanks to the measures observed, the bank’s market share increased to 11% from its former share of 1% after start of the restructuring efforts initiated as of 2006 upon successful operational period. With an ever-increasing accomplishments thanks to the financial solutions provided on behalf of its customers day by day, Creditwest recorded an increase of annual 30% was achieved during last 7 years with a rate of increase 3 times higher than banking sector throughout in Cyprus. Creditwest Bank Cyprus increased its overall assets to TL 1.763m and overall equity capital to TL 100m with 12 branches and ranked first among private capital bank in Northern Cyprus by the end of 2015. Investing on conformity to international accounting principles and transparency in its operations, the credit rating of the bank was increased to AA+ that indicated the level corresponding to “high degree of investment opportunity” by JCR (International Rating Organization) in 2015. Creditwest Bank Cyprus continues its successful projects in the field of finance with an increasing growth potential. ALTINBAŞ Bank was registered and founded on December 30, 1993. Sarayönü Branch, Bank’s first office was opened. Number of bank branch offices in Nicosia, Famagusta, Kyrenia and Güzelyurt was increased to 6 for the purpose of serving all regions of Northern Cyprus. Number of branch offices was increased to 8 by wide spreading modern banking services. 10. Service year witnessed increase in the bank’s employees to 100 officers. Starcard Ltd (Cardplus) was established for credit card services, by the cooperation established with other 5 robust banks in Northern Cyprus. Together with all financial organizations of Altınbaş Holding, the commercial title of the bank was updated as CREDITWEST Bank. Modern and fully-equipped bank’s Principal Office was commissioned. Volume of international money transfer was increased day by day and bank was promoted to “Super Agent” of Moneygram. First Expatriate branch was opened in Karaoğlanoğlu. For the first time, credit rating of ‘AA-’ assigned on behalf of the bank by International Rating Organization, JCR, together with “Positive” appearance were notified to all shareholders. The customer representation system has been adopted. The bank is the first local banking organization in Northern Cyprus that has been member of International Chamber of Commerce (ICC). The bank’s credit rating assigned by JCR on regular basis was increased to ‘AA+’ and reported as “Suitable for high level investment”. 180-seat Mehmet Altınbaş Conference Hall was provided on behalf of the formal education. Total active size of TL 843m and equity capital of TL 67m were attained, indicating the bank’s status included in biggest private banks in Northern Cyprus. With its total assets of TL 1.160m and equity capital of TL 82m, Creditwest Bank Cyprus’ credit rating was increased to ‘AA+’ that indicates “suitable for high level of investment” as rated by (International Rating Organization (JCR).